22. September 2018 – 8.00 p.m. The Women in Black in front of the Britto Bear on the grounds of the Berlin Kennedy School. The work of pop art artist Romero Britto and Anthony Kennedy Shriver, son of Eunice Kennedy, has been on the school gate since 2018. Eunice Kennedy was the sister of President John F. Kennedy. Let´s do Barbershop! 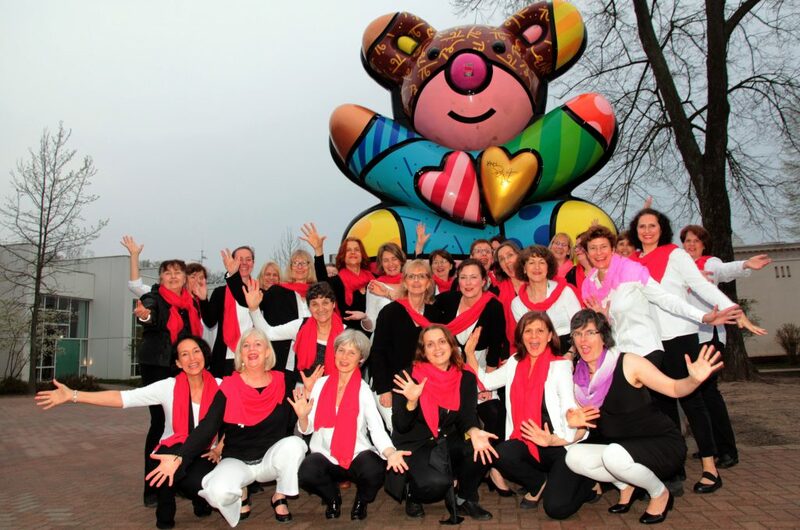 For the first time, the Berlin chorus Women in Black and the Barberellas from Bonn are presenting their enchanting program in the German capital. Everyone is sure to have a great time! Spirited uptunes and heart-rending ballads in close harmonies generate the distinctive barbershop sound. The singers tell the stories of life in their songs: rollicking and soulful, dancing and smiling, the lyrics usually have the same theme: love! These ladies look at the world through rose-coloured glasses, watch a storm roll in, or let men drive them crazy – who could blame them for seeking comfort in Schokolade? The barbershop style has its roots in the southern states of the US at the end of the 19th century. Barbershops served as social and cultural meeting places, initially for the wealthier white men, but later for blacks as well. Black barbershops emerged – places for black men of all generations – forging a shared identity. This is where the barbershop sound was born, an amalgam of Afro-American and Euro-American musical elements, which sometimes veers purposely off-key, only to resolve in the purest harmonies. Soon women, too, discovered the extraordinary sound. When these ladies hit the harmonies just right, they generate overtones – a sound you will not soon forget!